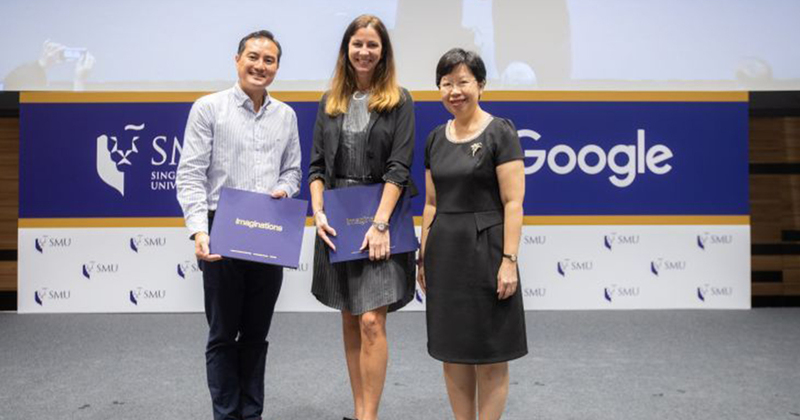 Singapore Management University (SMU) has signed an agreement with Google Singapore to offer an exclusive work-study programme to their undergraduates. Named the SMU-Google Squared Data & Analytics Programme, this is an extension of Google’s initiative of the same name, launched in 2014 in collaboration with the Infocomm Media Development Authority (IMDA). Previously, the programme was only open to fresh graduates, and this is the first time that the tech giant will be taking in undergraduates from a local university. Open the all SMU students from their second year onwards, the work-study programme includes a six-month internship programme at a media-related Google Partner company, which include names like Grab, Carousell and Dentsu Aegis Network. On top of that, they will also have to return to campus up to one day a week to complete two additional courses. At an event held yesterday to commemorate the partnership, Stephanie Davis, Country Director of Google Singapore, was optimistic about the new programme. “We’ve seen great success across the four years working with IMDA on the Squared Data & Analytics programme to give more than 90 graduates a head start in this fast-growing field.” She said. For its second run the number of students is expected to double to 50, with SMU and Google planning to scale the number of undergraduates that can be trained and developed each year.